Local players in camp: Running back Aaron Green (Madison High School/TCU), cornerback Darryl Morris (Wagner High School/Texas State), wide receiver Josh Stewart (College Station/UTSA), quarterback Dalton Sturm (Goliad/UTSA); wide receiver Carl Whitley (Roosevelt High School/Abilene Christian); Joseph Zema (Melbourne, Australia/Incarnate Word. Notable: The Commanders will have an open house from 11 a.m. to 4 p.m. Saturday at the Alamodome. Fans will be allowed to view the team's locker room and go on the field after Saturday's workout, scheduled for 11:30 a.m. to 1:15 p.m. . . . The Commanders are one of 10 teams in the Alliance of American Football. The other nine teams, with the head coaches in parentheses, are the Atlanta Legends (Brad Childress), Arizona Hotshots (Rick Neuheisel), Birmingham Iron (Tim Lewis), Memphis Express (Mike Singletary), Orlando Apollos (Steve Spurrier), Salt Lake Stallions (Dennis Erickson) and San Diego Fleet (Mike Martz). The Commanders will compete in the Western Conference with Arizona, Salt Lake and San Diego . . . Each AAF team will play a 10-game regular season. The top two teams in the Eastern and Western conferences will advance to the playoffs, with the championship game scheduled for Sunday, April 28, in Las Vegas . . . All eight AAF teams are having their training camp in San Antonio. Here are the camp locations for the other seven teams: Arizona (Dragon Stadium, Southwest High School), Atlanta (Farris Stadium), Birmingham (Gustafson Stadium), Memphis (Warrior Stadium, Cornerstone Christian School), Orlando (Benson Stadium, University of the Incarnate Word), Salt Lake (Comalander Stadium), San Diego Fleet (Heroes Stadium). SAN ANTONIO – The Alliance of American Football, which kicks off its inaugural season one week after Super Bowl LIII, was formed for players such as former UTSA quarterback Dalton Sturm. Sturm knows what it’s like to be a long shot. He made the UTSA roster as a freshman walk-on and went on to start the last 31 games of a college career that ended in 2017. Passed over in the 2018 NFL Draft, Sturm signed with the Dallas Cowboys as a rookie free agent last spring. Sturm was in the Cowboys’ training camp until getting waived Aug. 21, but he maintained hope that he would get another chance to continue his football career. 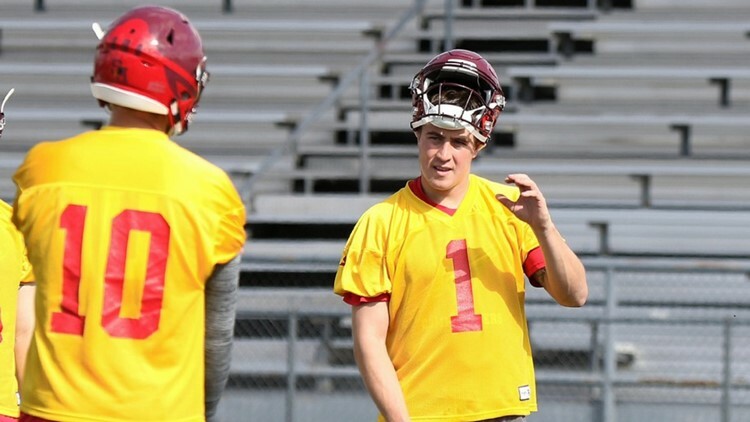 That opportunity came in late November when the Commanders, San Antonio’s franchise in the AAF, selected Sturm with the final selection of the AAF’s quarterback draft. “It was good, really good,” Sturm said. “Whenever I was released, I had a couple of opportunities to go with some other teams. But when I found out about this opportunity, my agent thought it was a great idea. I actually got pushed along by the (Carolina) Panthers as well. Sturm had a tryout with the Panthers last September. Dalton Sturm talks with Dustin Vaughan, another Commanders quarterback, during a break in practice at the team's training camp. A Goliad High School graduate, Sturm is one of four quarterbacks in the Commanders’ training camp. The other three are Dustin Vaughan (West Texas A&M), Marquise Williams (North Carolina) and Logan Woodside (Toledo). Vaughan, who made the Cowboys’ active roster as an undrafted free agent in 2014 is the odds-on favorite to start for the Commanders. Vaughan was the Cowboys’ third-string quarterback until getting waived on Sept. 5, 2015, when the team opted to carry only two quarterbacks during the regular season. A Corpus Christi Calallen grad, Vaughan also had stints on the practice squads of the Buffalo Bills, Pittsburgh Steelers and Baltimore Ravens before getting drafted by the Commanders. “I like the quarterback situation here a lot,” Commanders head coach Mike Riley said. “These guys are very professional for their young age. But you can tell they’ve learned a lot and they’re very easy to work with. You can tell they’ve been around the block. Riley was referring to Daryl Johnston, the Commanders’ general manager; Bob Morris, director of player personnel; and John Peterson, director of football operations. Sturm became UTSA’s starting quarterback as a sophomore and finished his career as the Roadrunners’ all-time leader in passing efficiency (134.7). He set a single-season school record for passing touchdowns with 20 as a junior in 2016. Sturm also set single-game records for passing yards (367), passing TDs (4), passing efficiency (257.9) and total offense (395 yards). He raised his stock as a potential pro when he was named offensive MVP of the College Gridiron Showcase & Symposium in early January last year. 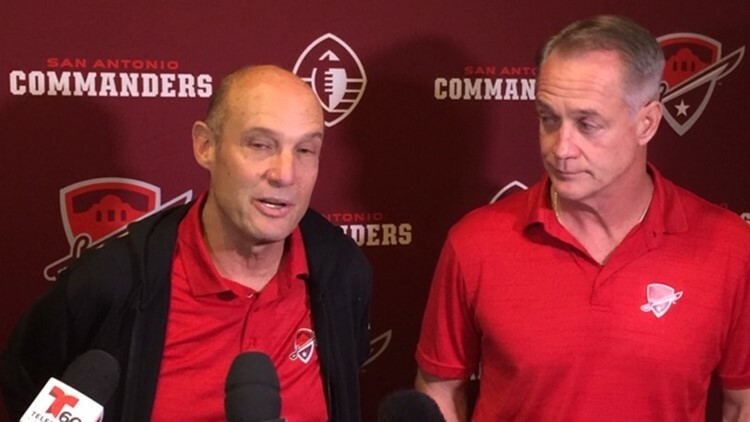 Commanders head coach Mike Riley, left, has praised the job Daryl Johnston and the team's front office did in the AAF quarterback draft. Riley likes what he’s seen of Sturm during training camp, saying the UTSA alum could be a “poster child” for the fledgling AAF. “I love Dalton,” Riley said. “Dalton’s got kind of a good story behind him. I think that he walked on. Won his spot. Won games. I think he has a lot of self-confidence and I think understands quarterbacking. I’ve been impressed. Sturm attended the team’s minicamp in December, but didn’t throw because he was still recovering from an injury in his throwing arm (right). Although Sturm didn’t make it through training camp with the Cowboys, he learned some valuable lessons on and off the field. Riley said he still hasn’t decided whether the Commanders will carry two or three quarterbacks on their 52-man roster during the regular season. He left open the possibility they could open the season with four quarterbacks. “It’s still an open question,” Riley said.